FANG+ Options are a new exchange-traded product that offers a capital effective way to gain exposure to some of the world's most highly traded technology growth stocks. The NYSE FANG+ Option is a cash-settled, European style contract with a $100 multiplier. (Options Symbol: FAANG). The NYSE FANG+ index includes 10 highly liquid stocks that represent the top innovators across today’s tech and internet/media companies. The index’s underlying composition is equally weighted across all stocks, providing a unique performance benchmark that allows for a more value-driven approach to investing. While the performance of indices weighted by market capitalization can be dominated by a few of the largest stocks, an equal-weighting allows for a more diversified and represented portfolio. NYSE FANG+ is one of the most highly correlated indices to technology and related stocks. 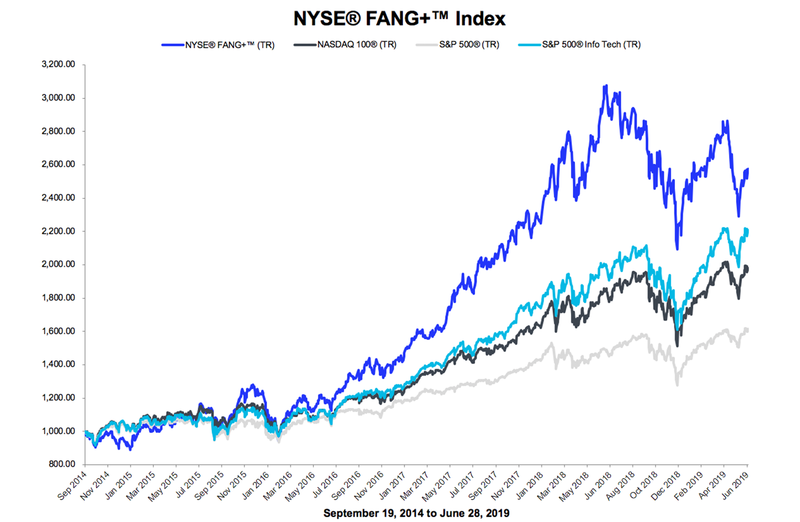 The NYSE FANG+ Index has returned a 24.20% annualized total return from September 19, 2014 to March 29, 2019*, as compared to 15.21% for the NASDAQ-100®, 10.13% for the S&P 500® and 17.57% for the S&P 500® Information Technology Index. Real-time index calculations are available to help you benchmark the core group of stocks included in the index, and official open and close prices are published daily on the ICE Data Global Index Feed. *The NYSE® FANG+™ Index launched on 09/26/2017. Prior performance (09/19/2014 to 09/25/2017) is based upon backtested index calculations. Gross total return variants are shown for all of the indices in the chart. The NYSE® FANG+™ Index is an equal-weighted index, whereas the other indices represented in the chart above are weighted based upon market capitalization. Apple® is a registered trademark of Apple, Inc. Facebook® is a registered trademark of Facebook, Inc. Amazon® is a registered trademark of Amazon Technologies, Inc. Netflix® is a registered trademark of Netflix, Inc. Google® is a registered trademark of Google, Inc. Alibaba® is a registered trademark of Alibaba Group Holding Limited. Baidu® is a registered trademark of Baidu.com, Inc. Nvidia® is a registered trademark of Nvidia Corporation. Tesla® is a registered trademark of Tesla, Inc. Twitter® is a registered trademark of Twitter, Inc. S&P 500® is a registered trademark of Standard & Poor's Financial Services LLC. NASDAQ-100® is a registered trademark of NASDAQ, INC.
None of the foregoing entities are affiliated with, endorsed by, or sponsored by Intercontinental Exchange, Inc., or any of its subsidiaries or affiliates, and the inclusion of the entities on our web site does not evidence a relationship with those entities in connection with the Index, nor does it constitute an endorsement by those entities of the Index or NYSE. NYSE FANG+ Index is a trademark of ICE Data Indices, LLC or its affiliates ("ICE Data") and has been licensed for use in connection with the NYSE FANG+ Index Futures. The NYSE FANG+ Index Futures is not sponsored, endorsed, sold or promoted by ICE Data Indices, LLC. ICE Data makes no representations or warranties (i) regarding the advisability of investing in securities or futures contracts, or (ii) that any such investment based upon the performance of the NYSE FANG+ Index particularly, or the ability of the NYSE FANG+ Index will track general stock market performance.